It was clear watching game 2 of the NBA finals last night between the Lakers and the Celtics, that I was watching basketball at the absolute highest caliber that I’ve ever seen before. 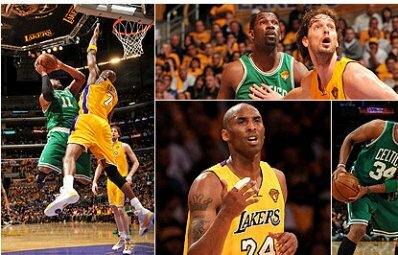 From Ray Allen setting an NBA final’s 3 point record, to Kobe Bryant coming in to close the half and scoring 3 pointers at will – last night’s game 2 of the Lakers vs. Celtics was amazing to watch as a basketball fan. The Lakers seemed to have a pretty easy way of coming back from a pretty big deficit in the first half. I though for sure with this come back that the Lakers were going to come into the second half and start pulling away from the Celtics. But the hard fought efforts of people like Rajon Rondo, and Glen “Big Baby” Davis, the Celtics were able to fight off the relentless attacks of the Lakers and end up winning game 2 of the NBA Finals. Game 3 of the NBA Finals is now heading to Boston on Tuesday night with a 9pm tip off. I have to say however, that unless Boston can come in and play at the high level of caliber of basketball each and every game, then the Lakers will end up winning the NBA finals. The Lakers are a refined machine, losing does not come easy for these guys. I can see you envy your skin and color, we are proud to be black. we are proud of who we are and how we are created. You having that racist in your mind is a disease to you and it will follow your children and all generations that will follow you. Go ask you mum who impregnated her to give birth to you and who is your real father. Go furk you mum if you don't understand.